This super tasty peanut butter sauce helps to jazz up ordinary protein-packed chicken tenders, especially if you enjoy an Asian flare. I’m positive this recipe will soon work its way into your regular dinner rotation—it’s always a big hit with my gang. Thread chicken through wooden skewers and season with a sprinkling of salt, pepper and other preferred seasonings. Coat a large skillet with nonstick oil spray and warm over medium-high heat. Add skewers and cook for about 5 minutes on each side, or until they’re cooked through. Add more cooking spray, if necessary, to prevent skewers from sticking. Alternatively, you can easily grill your skewers. To make the sauce, mix peanut butter, broth, water and soy sauce. Stir until smooth and completely combined. Add a few optional dashes of hot sauce, if desired, and mix. 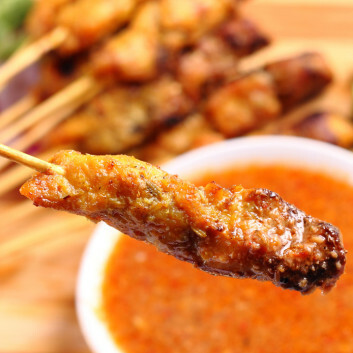 You can either spoon a bit of sauce on the second side after flipping, while skewers are cooking, and serve extra sauce for dipping, or cook skewers plain and serve the sauce for dipping. Try these simple and delicious chicken recipes: Chicken Lettuce Wraps and Chicken Parm Meatballs!